I must have at least a million cookbooks, more or less. There's some in the kitchen, some piled up beside my bed and even more spread throughout the rest of the house. Frankly, they're out of control and I need some way to organise them before they rise up and take over. 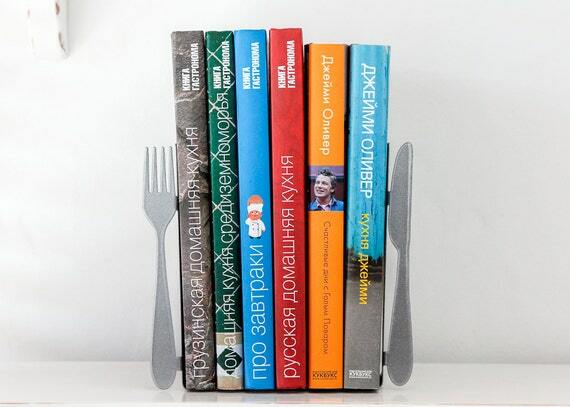 I've had my eye on these fantastic cutlery bookends for a while and it might be time to get a knife and fork to keep my recipe books in check. These brilliant bookends are £29.57 plus £8.70 for delivery for the pair from DesignAtelierArticle on Etsy. I'm rather fond of these chef bookends, too. I like to think they're cooking dishes from the recipe books they're holding in place or maybe they're whipping up new recipes for the next cookbook to grace my shelves. They're £29.95 from Furnish. 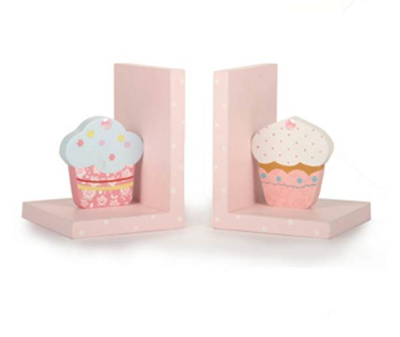 If you've got piles of baking books, these cute cup cake bookends would be ideal. Just picture your Great British Bake Off and Lorraine Pascale recipe books, sandwiched between a couple of beautifully decorated cakes. These sweet little cakes are £9 from Vintage Hut. I love reading cookbooks in bed. On a Saturday morning, with a cup of tea.